Yesterday was my dear husband’s birthday. To celebrate we trekked to Little India in Kuala Lumpur for a curry feast. The sheer sight of my enthusiastic dining partner devouring everything beneath his nose made quite a scene. The waiters looked on in amazement that he wasn’t bothered by the heat. I couldn’t help but to think that this must be what it would be like to dine with Thor or some other Viking God after battle in Valhalla. The result of all this indulgence was that we quickly fell into a food coma from which we could never fully awaken, at least not for another day or so. What was needed, when we finally managed to crawl back into the land of the hungry was something simple, filling and just as tasty. So, I put together his favorite pasta dish-Spicy Chorizo and Tomato Sauce over al dente penne. This dish had everything we needed: salty Chorizo in a light garlic and tomato sauce with a bit of added heat. Even my 2 year old is in love with this easy pasta sauce but only if I am gentle with the red chili flakes (which is fine since I add them at the end). Delicious, easy and quick to make… No wonder it’s a favorite. Salty Spanish Chorizo in a light garlic and tomato sauce with a bit of added heat. Serve over pasta for a delicious and easy meal. Dice the Spanish Chorizo as finely as you can get it. I cut it into roughly 5 mm/ 1/4 inch pieces. Empty tomatoes into a large bowl and crush with your hands until no large chunks remain. In a large sauce pan, add olive oil over medium/medium high heat. Once oil has picked up the color and flavor of the Chorizo, add minced garlic, stir and cook until fragrant (about 1-2 minutes). Add crushed tomatoes and oregano. Stir together, cover and cook for 8-10 minutes until nice and bubbly and all flavors have married together. Sprinkle sugar over sauce and stir. Serve over al dente penne pasta with a garnish of Italian parsley and grated Parmigiano-Reggiano cheese. Dice the Spanish Chorizo as finely as you can get it. I cut it into roughly 5 mm/ 1/4 inch pieces. Empty tomatoes into a large bowl and crush with your hands until no large chunks remain. In a large sauce pan, add olive oil over medium/medium high heat. Add chopped Chorizo and let cook until olive has picked up a reddish hue. This should take around 3-5 minutes. Add crushed tomatoes and oregano. Stir together, cover and cook for 8-10 minutes until nice and bubbly and all flavors have married together. Sprinkle sugar over sauce and stir. Continue to cook for a minute or two. Season with salt and pepper to taste then serve. 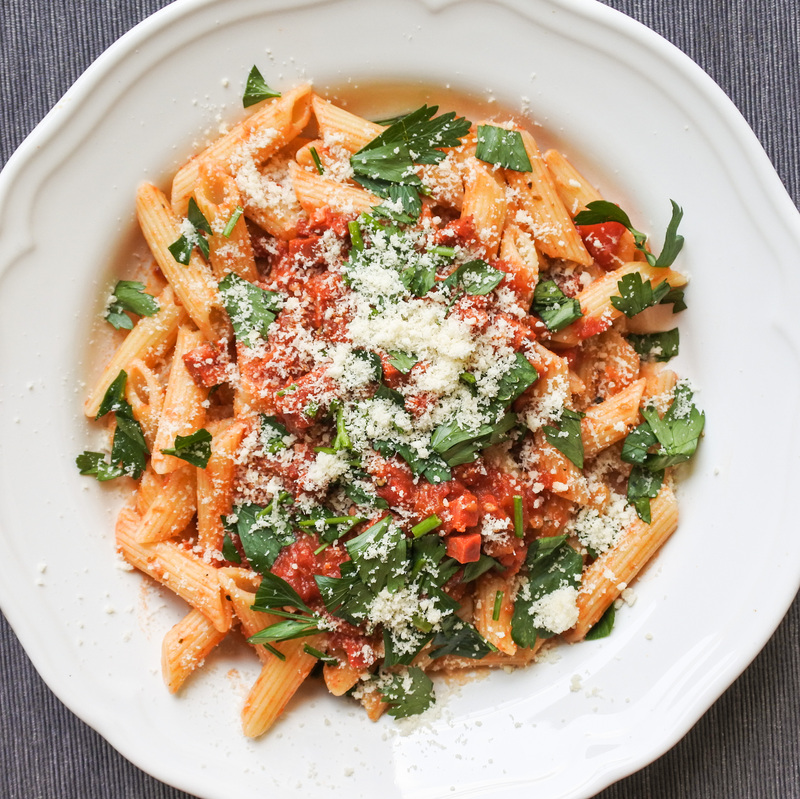 Serve over al dente penne pasta with a garnish of Italian parsley and grated Parmigiano-Reggiano cheese.